How to become a Freemason..? It is with great pleasure I welcome you to our website and send you our warm and fraternal greetings. It is a great honour for me to take the office of R.W.M. once again in this my 60th. year as a Freemason and I sincerely thank the members of Lodge Ugie for electing me. This is going to be an action packed year especially with it being the centenary of our Lodge building. We have our usual Bowling Weekend on 26th. and 27th. May. Open Doors Day at the Lodge on 9th. June during the Village Gala which is always a great success. A presentation of a cheque to Charity of money collected from the Travelling Trowel including a donation from Provincial Grand Lodge. 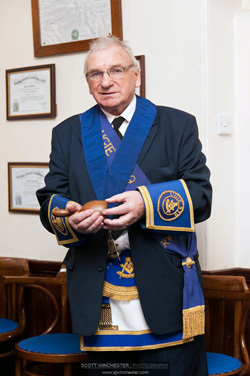 Culminating in the re-dedication of the Lodge Building on September 22nd., 2012. I know I will have the full support of the Office Bearers and Members of the Lodge and look forward to seeing our Honorary Members and visitors during a busy year ahead. Grateful thanks are extended to Honorary Members Bro's. Duncan Russell and David Cooknell for their continued hard work in updating and maintaining our website which I hope you enjoy browsing through and should you wish, please feel free to leave your comments in our guestbook.